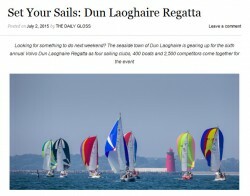 The countdown is on to Ireland’s biggest sailing event, the Volvo Dún Laoghaire Regatta, which takes place from Thursday July 9 to 12. There will be a fantastic fes­tival atmosphere across the waterfront and Dún Laoghaire as four sailing clubs, 400 boats and 2,500 competitors come together for the biennial event. W M Nixon casts an eye over something special.